This description of process-based work couldn’t be more beautifully stated. Like many artists before me, and alongside me, I view much of my completed work as more of a circumstantial aesthetic result rather than an architectural objective; these things I’ve made are a byproduct of thought, research, and labor. I’m perpetually living in the future until I am finally once again caught up in the making of the work, existing wholly in the present. It isn’t that it’s lifeless by the time I am through—more that it has become an artifact of the past. It is not the most interesting thing to me, the work on the wall. Making it is. So this kind of work made by methodically obsessive artists is in fact the quintessential product of process: thousands and thousands of hand-made lines across fields of paper (and I regard cutting and sewing a continuation of draughtsmanship, rather than something outside of it). I spend my time drawing the same shape over and over until I feel it’s done, but I have no idea when that will be when I set out. The edge of the paper? After that, how many pieces or layers or lengths? I’m an obsessively focused minimalist drowning in abundance, blind to the outside world as I become caught up in the way ink sinks and bleeds into velvety paper; the sound of yarn or twine pulling through laboriously punched holes; the way charcoal feels beneath my fingers as I grind it relentlessly into the paper. I’m chasing after the moment where I am no longer aware of the outside world; a sort of trance state caught up only in breath and mark-making. I am, in a sense, looking for the moment where I lose time. Drawing each mark is a meditation whereupon I become thoroughly engrossed in the act of making a thing. This is at the heart of every process-based work—the intentional act of hyper-focusing on one object, towards the end of being caught up in the making of that object. The supposed finality of it is simply a space between making that and other objects, a rest between measures. It is a rewarding experience; we fall in love with the growing artifact blooming underneath our feverish hands. We bend and sway under its release, there is pleasure in its unfurling. It is an intensely vain and [self] indulgent act. It is a necessary act. Each of these objects is a gross accumulation of one simple thing repeated over and over. Together they compile a percussive map of where I have been. Some objects in this map are erratically placed, the lines more shaky, and visible mistakes are evident. This happens because, as fellow Project Room guest Amanda Manitach has pointed out in regard to her own work, this process is a masochistic one, inflicting physical pain over time—cramping fingers, sore wrists, blurry vision, headaches. As the physicality of the work takes its toll, lines waver. Over time, as I regain my ground, the lines become more solid—the struggle subsides as I find my pace, slow down, lose time once again. I am a conduit to white noise, translating some strange language or transmission. This is a reading. I am taking measure of myself and things around me. This is not a unique process to artists—we all walk through the world creating a personal cartographic journal. This is that journal, only meticulously recorded by my hand—here is where I breathe in, breathe out, leave a mark, move forward, repeat. Always, the work is a product of research and applied philosophy. Even more than making it, I am constantly thinking about it. I’m buried in the pages of ten or twenty different books by old and contemporary French, German, or American theorists and historians; twentieth century astronomers and cosmologists, lush Phaidon compendiums on contemporary drawing, sculpture, or installation; or tumbling head first down a Wikipedia hole about linguistics, or some branch of mathematical theory that I barely understand but somehow find myself relating to. I’m thinking of all the things I can carry—emotionally, mentally, physically. It is a metaphor realized through a series of philosophically-shaped objects, descriptors, signifiers and nonsensical language; a lifelong fascination which, for me, has no end. In an explanation of the process, I once said that I felt form occurred through a self-leveling patterning of many imperfections; that any microscopic view will inevitably reveal scars, flaws, and ruin—yes, things look quite rough under this kind of scrutiny. After so many hours of staring, I often feel the work is ugly, extra-terrestrial, and completely unrecognizable; or at worst, utterly boring. After I have reached that arbitrary point of completion and I’m able to install the work in the intended space, only then am I finally able to broaden my scope of vision, adjust my focus, and see some semblance of beauty, symmetry, and conclusion. This is where process has led me, a place of calm, comfort, and recognition in a field of textures and patterns. Whether it’s purely aesthetic, spiritual, or psychological—or all of it—the grounding sense of tessellated objects is calming. In multitudes, they go on forever without end. Artists who are buried in process put themselves there compulsively because they must. It is a pathological drive to focus intensely on the act itself. The work is an end to a means—it is its own reward. So in the end, if all I heard from anyone was acknowledgement of the amount of work I had done, I would be pleased. It would be enough. I would feel that you’ve seen through me, deep into the core of what I am doing; that we are both laboring, waiting, repeating. I am building a map. I am leaving a trace. You are walking it with me, caught in the process, reliving its making. And if I am successful, you are making your own, and finding your way. 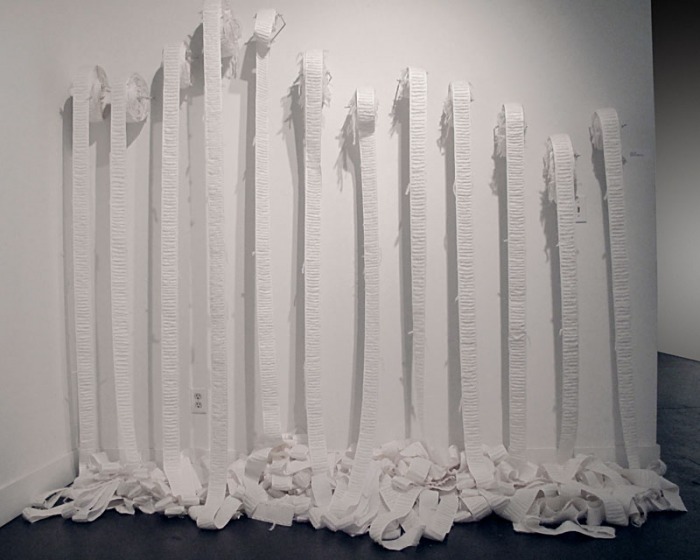 Images: gut[ted][ing][s], 2011 by Sharon Arnold; arches cover white, strathford drawing roll, glue 26 foot long installation (above). carry the one, drop the rest No. 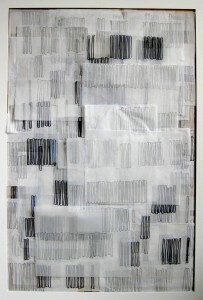 1, 2011 by Sharon Arnold; tracing paper, acetate, graphite, sharpie (at left).